Browse Artists and Groups Paul Vanier Beaulieu, R.C.A. Paul Vanier Beaulieu's career as a young painter took shape at a time when a dynamic current of revitalization was sweeping Quebec's cultural scene. The movement ultimately fostered the advent of modernity in art owing to the initiatives of its main proponents: John Lyman, Alfred Pellan and Paul-Émile Borduas. During the years Beaulieu spent studying at the Montreal School of Fine Arts, his classmates included Stanley Cosgrove and Jean-Paul Lemieux, who would be at the vanguard of artistic innovation in the 1940s. Yet, although he shared the same natural inclination for freedom as his fellow artists, he did not have the opportunity to join their ranks at the Contemporary Arts Society when it was founded in 1939. As it turned out, he had left for Paris in 1938 so as to tap directly into the source of artistic renewal that he had seen beginning to emerge in Quebec's art community. Nor was he able to witness the enthusiastic reactions of living art advocates upon viewing the paintings Pellan had brought back from Paris on his return in 1940. As a Canadian British subject, Beaulieu had been detained in an internment camp where he would remain until the liberation of Paris in 1944. However, having missed out on these decisive moments in Quebec's art history in no way affected the richness of his work or hindered the direction of his personal artistic development. He realized at a very young age that his destiny lay in artistic creation and he eagerly embarked on his own path, independently of schools and movements in Quebec. Beaulieu was born in Montreal on March 24, 1910 to a distinguished family residing on Saint Louis Square. The poet, Émile Nelligan, had also lived in the neighbourhood, an almost mythical cultural locus where other luminaries would later take up residence: the poet, Gérald Godin, his companion, Pauline Julien and filmmaker Claude Jutra, to name but a few. An intense artistic atmosphere pervaded the Square, and the Beaulieu family was sensitive to it: the father, Joseph-Alphonse Beaulieu, was a lawyer who enjoyed surrounding himself with works of art. He had a sizable library of books dealing with art and art history and even painted as well, producing skilful portraits of his Quebec Bar Association colleagues. His wife, Augustine Vanier, shared his interest in both admiring and executing paintings. It therefore comes as no surprise that all seven children in the Beaulieu family, of whom Paul was the eldest, developed a strong affinity for art. Claude, an architect and city planner, became the artistic director of the journal Vie des Arts and specialized in religious architecture. Louis, who was also a painter, pursued a solid career under the pseudonym of Louis Jaque, while Gérard, an engineer, became a knowledgeable collector of contemporary art. Beaulieu started learning about art at around the age of ten by thumbing through illustrated art books in his father's studio-library. He would borrow his father's box of paints and brushes to create his own versions of his comic book heroes. The budding artist was about fifteen when the family went to live in Sainte-Thérèse, a northern suburb of Montreal. Encouraged by his father, he began to go outside and paint landscapes on the spot. The appeal of colourful visions, shapes and forms, and above all the joy of capturing them and transposing them onto a sheet of paper or a cigar box lid took on ever-increasing importance in his daily life, extending far beyond summer vacations. As a result, he lost all interest in academic activities and went from school to school studying subjects ranging from business to technical training, but with little success. He was looking for something else, something he had sensed in his experiences with visual representation. He considered it more and more: he would become a painter like all those artists who had free rein to work in their Paris studios. His parents readily agreed and in September 1927, at the age of seventeen, Beaulieu enrolled in the Montreal School of Fine Arts. He got down to work, eagerly applying himself to the study of drawing, decoration and painting. But as was the case at all the other schools he had attended up to that point, strictness and discipline were the rule at the Saint-Urbain Street institution. The methods of learning that were imposed did not correspond to his expectations. He yearned for greater freedom. Disappointed, he decided not to continue his training there and left in the middle of his third academic year. Naturally, his dream was still to live an artist's life in Paris, but to do that, he needed to come up with the requisite funds. To achieve his goal, he opened his own commercial art studio in 1930 in a building on Phillips Square, where the Art Association of Montreal, which later became the Montreal Museum of Fine Arts, had once had its art gallery. His friend, Gonsalve Désaulniers, was a partner in the venture and the Dupuis & Frères department store was among their clients. Although the financial crisis of the 1930s ultimately took its toll on the company, it managed to survive for nearly six years by adapting to changing market trends. At one point, it even became an interior decoration workshop located on the edge of Chinatown. When the experience came to an end, Beaulieu was penniless but still harboured his Paris dream. Like many young artists in his situation, he became a waiter. The job ensured him a reasonable livelihood and even enabled him to set some money aside. He had the good fortune of landing work at the famous Le Lutin qui bouffe restaurant on Saint-Grégoire Street. Its wealthy clientele appreciated the paintings the owner, Jos McAbbe, let Beaulieu hang on the walls in the dining area. Beaulieu had his afternoons free to paint landscapes inspired during that period by artists in vogue in the 1930s such as Suzor-Côté, Frederick Coburn, and Robert Pilot. Thanks to generous tips from customers and the sale of several paintings, he soon had saved up enough money. He booked passage on the Le Paris ocean liner, departing from New York in October 1938, and joined his brother Claude, who had been living in Paris since 1935. Paris! Paris at last! The long-cherished dream had finally come true. He settled in with his brother Claude at 17 rue Campagne-Première in Montparnasse, the mecca of art life in Paris. Located between Boulevard Montparnasse and Boulevard Raspail, the studio was a stone's throw from the legendary Dôme and Coupole cafés frequented by Picasso, Zadkine, Giacometti and scores of other writers and artists, including Canadians such as Dallaire and Pellan. Beaulieu spent a year diligently attending a course at the École nationale supérieure des beaux-arts de Paris (National School of Fine Arts in Paris), but like Pellan before him, it was not long before he became more captivated by what was being done by the contemporary art masters he happened to meet. "When I arrived in Paris," he confided during an interview that aired on Radio-Canada, "my training was primarily locally based. I greatly admired Clarence Gagnon and Maurice Cullen. And over there, Vlaminck made a strong impression on me because he did landscapes with broad colourful strokes using a palette knife. And then, little by little, the Paris school won out. I felt I could do something different." Paul Beaulieu started out by getting to know Paris in small doses. He walked along the streets and river banks and drew sketches: Notre-Dame, the bridges on the Seine, Ménilmontant, Saint-Germain. Then he met Dominguez, Florès and Palmiero, a group of Spaniards who, like himself, were living in Montparnasse. He slowly immersed himself in the atmosphere that surrounded the leading artists of the day: Bonnard, Dufy, Braque, Matisse. He met Rouault, Derain and, most importantly, Picasso, whom he admired. He visited Picasso's studio for the first time with his friend Florès. Meeting the "giant" incited Beaulieu to take up copperplate engraving again, something he had first learned with Robert Pilot at the Montreal School of Fine Arts. Picasso, who loved etching, had just finished his Vollard Suite in 1937 and showed his most recent plates to the young Quebecer. Soon after, Beaulieu went to the workshop of Roger Lacourière, one of Paris' foremost printers. It was there that he discovered new techniques that he was quick to try out on his own press in his studio. His initiation to the Parisian art world had gotten off to a wonderful start, but it was brutally interrupted when the Germans invaded and occupied France. Caught in the maelstrom, Paul and Claude Beaulieu were arrested in July 1940 as civil prisoners because of their Canadian British nationality. They were sent to an internment camp in Saint-Denis, where 2000 prisoners were being held captive behind barbed wire. There were 160 Canadians among the detainees. The Beaulieu brothers found themselves in the company of the painter Jean Dallaire and the architect Edouard Fiset. The artists managed to get their hands on some paper and paints, enabling them to sketch and paint. While in the camp, Paul Beaulieu produced a number of portraits of his companions in adversity, including several of his friend Dallaire. Time passed…very slowly. The internment lasted four years. Then finally, in August, 1944, the doors of the camp opened and Paul Beaulieu returned to his home on rue Campagne-Première. He got back in touch with his pre-war friends and made new ones, including Francis Gruber and André Marchand, painters whose work impressed him greatly. His life as an artist went back to normal. In November 1944, he landed his first solo exhibition at Henriette Vallot's gallery on rue Vaugirard. It was composed of paintings he had done before his internment and drawings from the "Saint-Denis period." The grouping marked the first appearances of clowns and other street performers that were to resurface many years later. To the artist's immense joy, several paintings found buyers. P. V. Beaulieu, as he signed his works–the "V" stood for Vanier, his mother's maiden name–succeeded in placing works with art dealers, including the Orsel and Meitzer galleries. After an absence of seven years, Beaulieu came back home in June 1945. He was pleased to see that the new trends in art emerging from the Paris school had made their way to Quebec as a result of the activities of painters returning from Europe such as Pellan. He took an interest in the works of John Lyman's followers at the Contemporary Arts Society, including André Biéler, Paul-Émile Borduas, Stanley Cosgrove, Goodridge Roberts, Fritz Brandtner, Marian Scott, Jack Humphrey, and Philip Surrey. In the fall of 1945, he exhibited a collection of his own works for the first time in Montreal. They were displayed on the walls of his family's home at 3679 Laval Street. There were paintings as well as prints that reflected his fondness for Cézanne's manner of cubism, Matisse's fauvist colour accents, Braque's compositional strength and the clarity of Picasso's drawing. A broad selection of still lifes appeared alongside harlequin figures and other clown motifs. He organized another more extensive exhibition in the spring of 1947 at the same location. This time, he displayed over one hundred paintings and prints. As usual, the works were primarily still life compositions, but there was a greater number of highly colourful figures. Rendered in a frontal pose, the figures stood out on the surface of the canvas, seeming almost hieratic yet at the same time exhibiting clearly naive local accents. They were drawn with broad strokes that carved out zones of bright contrasting colours to produce an effect that was at once striking and appealing. Although less numerous, the engravings in the exhibition generated the most attention because of their innovative quality. Beaulieu had brought back technical processes from Paris that were unknown here, such as sugar-lift etching and colour engraving using superimposed plates. However, he apparently did not do any engraving after his return to Montreal. 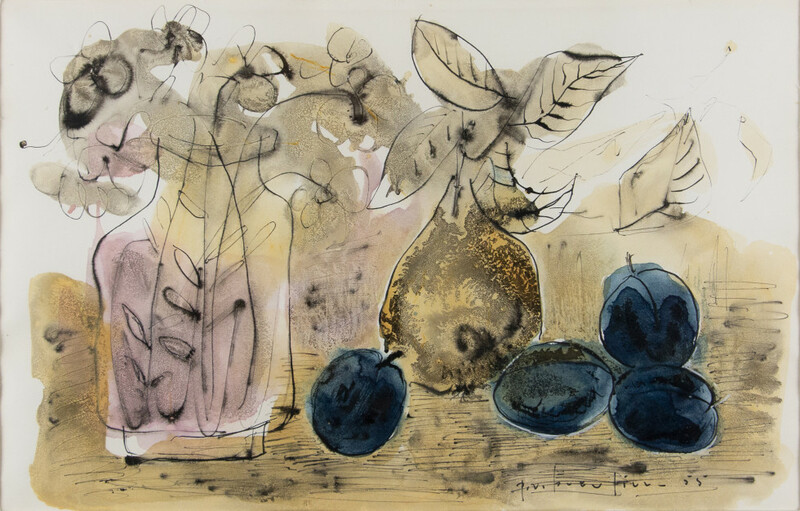 At most, he created a few monotypes. Still, he delighted in talking about his experiences with the process in Paris and the networks of studios he used to frequent. His remarks were of keen interest to Albert Dumouchel, a young instructor at the Graphic Art School who played a major role in the rise of a Quebec school of printmaking in the 1960s. In its awakening, Quebec's artistic community was gravitating around two poles dominated by Pellan and Borduas. Although not indifferent to what was transpiring, Beaulieu found it difficult to hold back the artist within him who remained immersed in the atmosphere of intense creativity that prevailed in the City of Light. In July of 1947, he set out for Paris and returned to his studio in Montparnasse. It was the beginning of an intense period of work. He painted, drew and etched. The still lifes and observation drawings piled up. Exhibitions followed in succession, accompanied by highly encouraging signs of appreciation. La Gentilhommière Gallery gave him a solo exhibition in the summer of 1949–his second in Paris. Several of the drawings and paintings had been executed during a trip he had just made to Provence. His work was noticed by critics, including Jean Moselan who wrote in the revue L'Opéra, "he goes out into the world and frequents city markets. With a sketch book in his pocket, he walks around and observes. He takes notes. No! He draws and he draws very well, even magnificently. Then he returns to his studio and creates his compositions. His paintings are a synthesis of a whole universe of things laid bare." A number of paintings were acquired by collectors who found a particular appeal in his still life compositions. They delighted in seeing a pitcher, some fish, or pears in a fruit bowl executed in a manner akin to cubism. Not surprisingly, critics drew parallels with Braque and Picasso, the masters of the movement, and also called attention to the pure colours reminiscent of Matisse. Most importantly, Beaulieu was recognized as an artist who was coming into his own. Over the coming years, he took part in group exhibitions such as the Premier salon des jeunes peintres at the Galerie des beaux-arts followed by the Salon de mai and the Salon de l'Art libre. However, the most significant event was probably the acquisition of his, Nature morte à la bouteille jaune (Still Life with Yellow Bottle), by the Musée national d'art moderne de Paris (National Museum of Modern Art in Paris) in 1951. He had painted it during a trip to the Draguignan region in Provence. This was the first work by a contemporary Canadian artist to be purchased by the museum, which had just opened in 1947 at the Palais de Tokyo on avenue du Président Wilson. The painting depicts a bowl of fruit set against a luminous light grey background. The yellow-green tones of the fruit match those of the bottle, half full of regional wine. That same year his, Nature morte à la bouteille et cerises (Still Life with Bottle and Cherries), which he had entered in the Province of Quebec Competition, earned him second prize, ahead of Pellan, who won third prize with Évasion, and his friend Dallaire, who came in fourth. First prize went to Jean-Paul Lemieux. Upon his return to Paris, Beaulieu took up engraving once again and regularly visited the studio of Georges Leblanc on rue Saint-Jacques. He honed his etching techniques by observing the works of masters like Johnny Friedlaender and Albert Flocon. In 1952, he created an artist's book entitled Ô Visages (Oh Faces), illustrating a satirical poem by Jean-Louis Vallas, inspired by the faces of people crossing the bridges of Paris. The piece was comprised of thirty-three etchings produced at Leblanc's studio. On copper, Beaulieu captured the changing expressions of human emotions, ranging from joy to anguish: "poor faded faces… painted faces… long faces… serious faces… sunken faces, gaunt faces… soft faces, stern faces, all washed out by the rain…" He interpreted strong emotions through a multitude of stylistic effects: the strokes are at times dense and expressionistic; at others, brisk and lively, or even quietly descriptive and naturalistic. A copy of the work was acquired by the Musée national des beaux-arts du Québec in 1953 and was the first book by a contemporary artist to enter its collection. During that same period, Beaulieu turned serious attention to watercolour, which he quickly mastered with remarkable skill. He experimented with a variety of techniques, using different kinds of paper to enhance the impression of fluidity of the colours on the surface. He was partial to the wet-on-wet technique. "I wet the entire paper with a sponge; I apply dobs of colour that spread in every direction; and then, using a pen, stick or anything I can find, I apply ink over that, drawing inside the colour. It creates effects. There's a part of it that is controlled, but I also let the water work on its own." Whether they were luminous landscapes, fresh still lifes or compositions boldly leaning toward abstraction, his watercolours had a joyful, lyric quality to them that captivated scores of critics and enthusiasts. Clearly, Beaulieu was thrilled with the freedom of expression and spontaneity that watercolours allowed. His affinity for the medium would remain strong throughout his career. At first, however, his watercolours were rarely displayed in galleries. Hardly any were shown in the exhibitions at the Waldorf Gallery in Montreal in the spring of 1953 and summer of 1954. Instead, there were large groupings of still life compositions that came to increasingly define his temperament. Coffeepots, fruit, cups, coffee grinders and other common objects were merely pretexts for creating representations, playful configurations and painterly scenes. A human figure occasionally made its way into his works: L'Homme au coq (Man with Rooster), Femme dans un paysage (Woman in a Landscape). The artist presented Nature morte au mortier (Still Life with Mortar) at the Montreal Museum of Fine Arts exhibition, Quelques peintres canadiens contemporains (Some Contemporary Canadian Painters) ,held during the 1953 Festival de Montréal. Beaulieu subsequently made a deliberate shift to representing human forms, reintegrating the marginal figures that had appeared in some of the works dating from his liberation from the internment camp. In so doing, he was tapping into a source of inspiration that had attracted numerous artists before him since the beginning of the century: Francis Picabia, Kees Van Dongen and of course Picasso, to name but a few. In Beaulieu's case, it triggered an abundant reappearance of street performers, clowns, acrobats and jugglers, crowds of nomads living on the fringes of circuses and music halls. He acknowledged that the bird-catcher that appears in his work had been inspired by the artist Philippe Clay. Beaulieu saw him singing one day and was particularly struck by the way Clay's hands moved, like a bird spreading its wings to take flight. The image spurred Beaulieu to do a whole series of drawings, some of which resulted in paintings. Despite their brightly coloured costumes and fanciful make-up, Beaulieu's clowns and harlequins project a certain melancholy and even sadness that his chess players also seem to share. None of the puppets dangling from strings and sad-faced marionettes appear to be having a good time. Perhaps the mood denotes the lingering memory of the long detention behind barbed wire. But the artist did not wallow in what was dreary or anecdotal. The exuberance of colour provided an excellent outlet. What was important lay elsewhere–in the lines, motifs and colour values that came to life in the composition of the paintings. 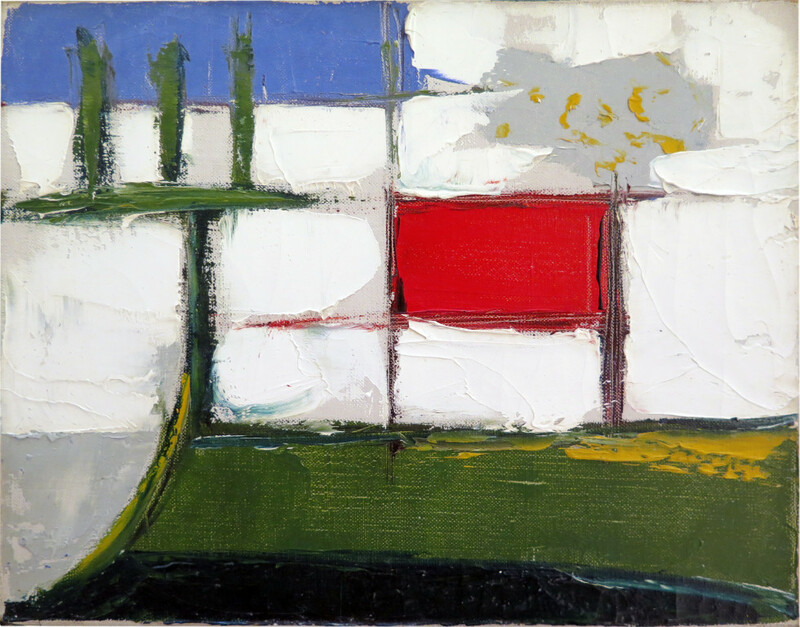 A trip to Brittany in 1957 was to have a decisive impact on the course of his pictorial experimentation. As a result, his leaning toward abstraction once again became a central issue. It had already been discernable in the layout of several watercolours. However, what was now emerging did not have the same fluidity as the earlier pieces. The small paintings he produced in Brittany placed the focus on bright colours that became denser. The material was built up in layers. It was a penchant that grew more pronounced during a 1958 visit to Mougins, in Provence, as well as over the course of his travels in the Estérel region and trips to Spain and Italy. He followed his usual procedure of painting landscapes on small canvases, bringing back more than one hundred quickly rendered works from his travels. He hung them in his studio and selected some to make large-scale versions, painting eminently structured compositions consisting of methodically organized patches of colour in a manner somewhat reminiscent of the works of Nicolas de Staël or Serge Poliakoff. These abstract works by Beaulieu have nothing in common with the gestural quality and expressionism typical of automatist painting. Rather, they borrow from naturalism and abstract landscapes. At times, they suggest Mediterranean architectural forms and the arid structures of cliffs baking in the sun; at others, they appear as mere planes of colour that are juxtaposed so as to create interactive geometric shapes. Beaulieu had been living and working in Paris since his return to Europe in 1947, producing multi-faceted works in his studio on rue Campagne-Première: still lifes, unusual portraits and landscapes using a variety of techniques ranging from oil and watercolour to copperplate engraving, etching, lithograph, monotype and decalcomania. He had fully integrated the Parisian milieu and was invited by Bernard Dorival, the curator of the Musée national d'art moderne de Paris (National Museum of Modern Art in Paris), to participate in an exhibition entitled, Three Canadian Painters, in the spring of 1958. He shared the honour with his already famous compatriots: Alfred Pellan and Jean-Paul Riopelle. Concerning Beaulieu's work, Dorival wrote: "Firm lines that resolutely communicate what they intend to say; dense colours that are given greater depth by chiaroscuro; powerful forms endowed with compact unity that create a whole, because they are the product of a single movement; matter reconstituted with love; through the transfiguration of objects by the artist's imagination, all these genuine qualities eschew any triviality that might compromise them." Although he was working in Paris, Beaulieu exhibited primarily in Montreal, owing to the sustained efforts of his brother, Gérard, who continued to promote his art. In 1954, an agreement was negotiated with Dominion Gallery owner, Max Stern, who served as Beaulieu's exclusive representative until 1965. The agreement ensured the artist a modest but regular income that allowed him to meet his needs and remain in France where he could continue unhampered by restrictions. The gallery held an initial solo exhibition in February 1957. Montrealers had an opportunity to admire some sixty paintings–a wide selection of still life compositions–circus scenes and a few landscapes recently painted in Brittany. Garçon à l'oiseau (Boy with Bird), Nature morte aux œillets (Still Life with Carnations), Les joueurs d'échecs (The Chess Players), Les Saltimbanques amoureux (Acrobats in Love), La Marionnette (The Marionette) and L'Oiseleur (The Bird Catcher) were among the works listed in the exhibition. In February 1958, the Montreal Museum of Fine Arts invited Beaulieu to exhibit in its Gallery XII, dedicated to displaying works by contemporary artists. He shared the space with his friend, Jean Dallaire. Beaulieu assembled a series of exceptionally vibrant watercolours that critics described as "dazzling." An exhibition at Stern's gallery in the spring of 1959 was composed of canvases from the Haute-Provence period, where Beaulieu's penchant for abstraction was evident in the terraced white walls set against sun-scorched slopes. One exhibition followed another: at the Dominion Gallery in 1962 and the new Camille Hébert Gallery on Bishop Street in 1965. In 1968, his works were displayed in a small gallery that had just opened in the Laurentian village of Saint-Sauveur-des-Monts. His watercolours were so popular that the owners decided to organize a major exhibition for him in the fall of 1971. It was a true retrospective–an impressive panorama spanning his thirty-three-year career. Over one hundred works were shown, fittingly including samples from all periods and of every technique, genre and subject. A large portion of the exhibition was devoted to a selection of recent works that clearly marked a return to the figurative vein begun in the late 1960s: flamboyant strutting roosters and sweeping landscapes–decors inspired by the magic of autumn–bursting forth in a veritable explosion of colour. It was a phenomenal success, so much so that Beaulieu became a driving force at the gallery, with subsequent showings in 1972 and 1975. It was no doubt during those times spent in the little Laurentian village that Beaulieu began to entertain the idea of coming back home for good. Everything seemed to point in that direction. The natural beauty of the Laurentians was a source of inspiration for paintings imbued with a newfound vitality and art lovers were wild about them. Besides, life in Paris was beginning to weigh on him. The city was hectic and noisy and now seemed devoid of artistic excitement. The prospect became increasingly attractive and, in 1973, on the advice of a friend, he bought a little house on a quiet street in Saint-Sauveur-des-Monts which he enlarged by adding a huge studio. "I'm coming back to Quebec now," he said, "because I've come full circle. I'm returning to my roots. Nature in the Laurentians is calling out to me. To tell the truth, I was often homesick in Europe and I'm very happy to be coming home." Beaulieu continued to paint at his peaceful retreat and his work was in great demand. In the 1970s and 1980s, the Frédéric Palardy Gallery in Saint-Lambert, the Bernard Desroches Gallery in Montreal and the Vincent Gallery in Ottawa all honoured him with retrospectives that won the acclaim of art lovers and collectors. Then in 1994, the Simon Blais Gallery exhibited an extensive selection of watercolours, drawings and prints created between 1950 and 1971. The time had come to reflect on his accomplishments. Over the years, works by Beaulieu have been acquired by a number of major public collections: Montreal Museum of Fine Arts, Montreal Museum of Contemporary Art, National Gallery of Canada, Quebec National Museum of Fine Arts, Musée national d'art moderne de Paris (National Museum of Modern Art in Paris), London Art Museum, Winnipeg Art Gallery, Philadelphia Museum of Art, Tel Aviv Museum of Art. Beaulieu died on April 20, 1996 in Saint-Sauveur-des-Monts. In June of that same year, the Mont-Saint-Hilaire Art Museum dedicated an extensive exhibition to him in tribute to his body of work. The following year, the Marc-Aurèle Fortin Museum in Montreal recognized Beaulieu's extraordinary contribution to the artistic heritage of Quebec. Though he worked in Paris for over thirty years, he never broke with his deeply rooted ties to his country. Beaulieu's art continues to speak to us in hundreds of works, including those that can be admired in this exhibition. © Copyright Germain Lefebvre & Galerie Walter Klinkhoff Inc. Source: Paul Vanier Beaulieu Retrospective Exhibition Catalogue, Galerie Walter Klinkhoff, 2009. Please send me more details about the following artist. Paul Vanier Beaulieu, R.C.A.